95% Assembled, easy for installation. Bowden style Titan Extruder with improved hotend design. Very stable structure with Full Aluminum Frame design. Switchable 110/220V, 250W, 50Hz, 0.89A. My anticipation of my first printer was dampered because I recieved my printer 20 days after I orderd it which is over what the web site suggested. That being said, I Set it up and did the fine tuning I needed and started printing. I have a lot to learn, but that is the chalange part I was looking for. I still need to learn a lot about settings for slicing. I am excited and happy this is the printer I was hoping for. I have read about people having trouble removing a print, The new glass surface works so well if you let it cool, the print just lifts right off. Great !! I would recommend this printer and also 3D Printers Bay. First I would like to say the delivery time on the website is not accurate it to 20 days to receive my printer. With that said they were always very responsive to my emails. The printer is great it took about 30 minutes to assemble had trouble with material sticking to bed but applied glue stick worked great. My tornado was printing great right out of the box.Pla, petg, and tpu so far, working on an enclosure right now to do some abs. had mine in 4 days just check the mechanics + adjust your vrefs and you can start on your calibration prints to fine tune it. Printer arrived at time, good packaging, setup was fairly easy. 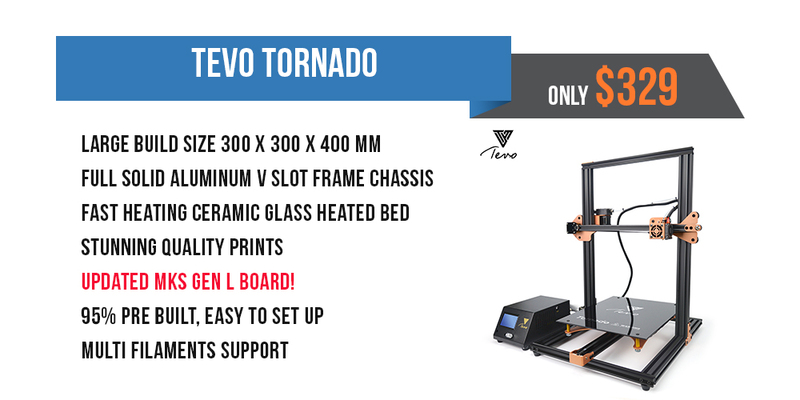 The Tornado test print is hardly to remove from the bed sheet. I had to remove it from the bed before starting to print. So now I'm without this sheet. In overall I'm happy with purchase.